This is the brooder that we imported from Europe when the AUD was good value against the EU. We have since imported two more for friends. This unit, like all of them, has good and bad points but we have been working with the manufacturer to improve some of the minor annoyances which is really great. Ours is the first one imported out of Europe. They come unassembled like a Meccano set, in hundreds of pieces, so you have about 3 hours of assembly time, which is a bit of fun. Being 5 tiers the space saving is amazing and it's very simple to maintain and clean. It has heater unit running the full length of each tier with two globes each end. The globes are very low wattage and just to make the sight better. The heater unit has an adjustment dial and a separate switch for the lights. These photos are for our 5 Tier unit, but you can get them in 2, 3 and 4 Tiers. A new unit like the one below, landed in Australia, will set you back around $1400.00, which has to be pre-paid. This picture below was testing the lamps is just before we finally assembled it. That box on top of the unit is the container for the water which is gravity fed into each tier. 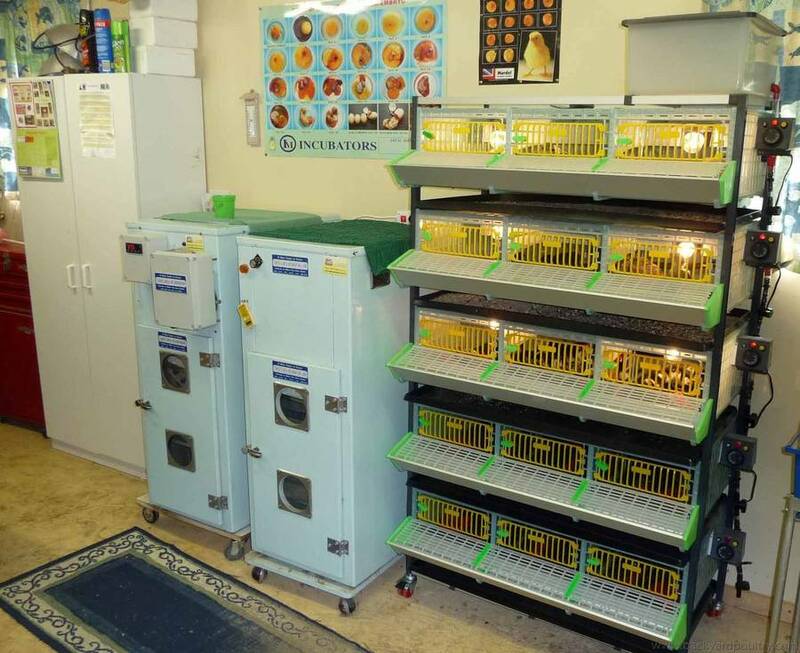 This is in our Incubator Room and shows the 5 Tier next to the Incubator and Hatcher. You can see the dials for the heater unit on the right of each tier. We have since added manual switches to each tier of the waterers so you can block off any tiers below. If you look very carefully you can see the chicks in the first three tiers. Close up of one of the tiers where the first Australorp, Langshan and Campine chicks for the season pioneered the use of the brooder. That big wide bar across the back is the heater unit. You can see it also has an automatic watering system, but the little waterer you see in the front is for our CRD mix for the chicks. Did you guys also have to alter the power or did it come configured for Australian power plugs etc...I am assuming that the grey boxes and dials are thermostats? You would have to breed a lot of birds to fully utilise the 5 tiers......do they also make/supply single units? Wow, what a great setup! So how many would you fit into each compartment, and at what age would they need to be moved out of here? Is that bar going right across the front for food? How easy is it to clean? Thanks, yes we are very pleased with it. Yes, they are in 230/240v for Australian, UK, NZ and most European conditions. 110v is the USA and Canada. The only thing we had to change was the one two prong to three prong electricity plug by using an adapter on the main outlet to suit our Australian fittings. The little grey box on the side is the individual thermostat controls and light switch for each tier. You can get them in two, three, four or five tiers. You can hypothetically fit 50 or 60 to each compartment, but we breed our fowls in much smaller weekly batches of anything from 10 to 25 because we can then stagger them to show. We're not commercial breeders who sell an overabundance of chicks. We move them out when they have good wing feathering, approximately four weeks, and they then transfer to a large pallet sized crate with a lamp for comfort. The bar across the centre is for bulk feed as they get older. When they are up to five days old we feed them in very tiny little containers and for the first three days of life, plus we add a separate little waterer with their CRD/Vitamin mix. Cleaning is simple. Inside are triple mats which filter the droppings to a tray below. The chicks can't get to the tray as it's under the floor of each tier. 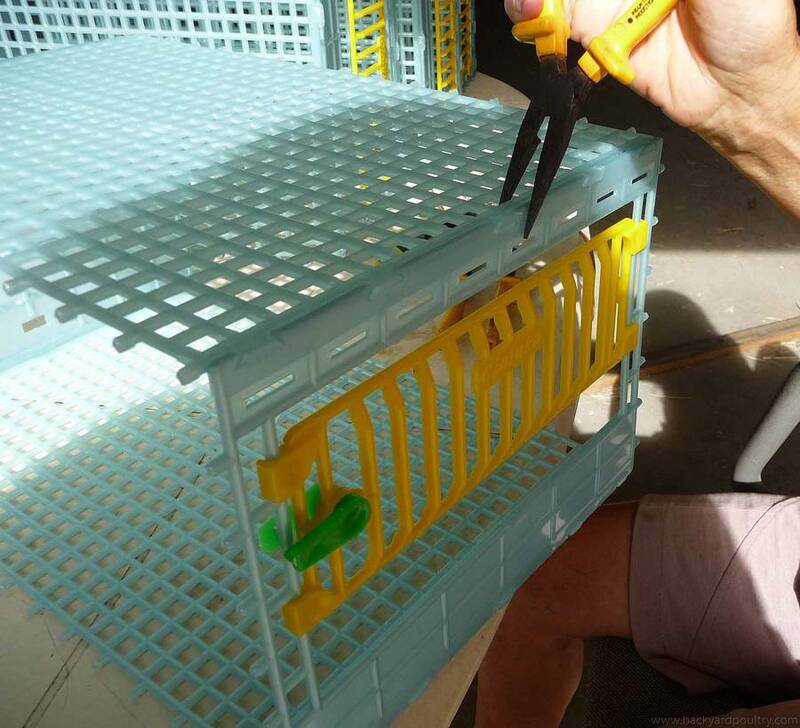 When the chicks are finished in the tier, we just remove the mats and the tray, clean the tier, the mats and the tray with a good disinfectant and start again. Are any retailers looking at importing these units to sell in the future? Currently we have been importing them ourselves on a pre-paid only order basis and so far we have delivered two x 5 Tiers and have 1 x 5 Tier and 2 x 3 Tiers on the way. The problem is that if it goes to a specific retailer the price will go up very high so the manufacturer, at this early stage, is happy to deal with his specific agents in each country. With the AUD currently high against the Euro you have to watch the costs. Looks good Ross, I wish I had the space of your incubator room. What sort of numbers will each tier house & what age limit does it have, our Multiplo's are only good for max 4 weeks. Oh wow! that looks great. 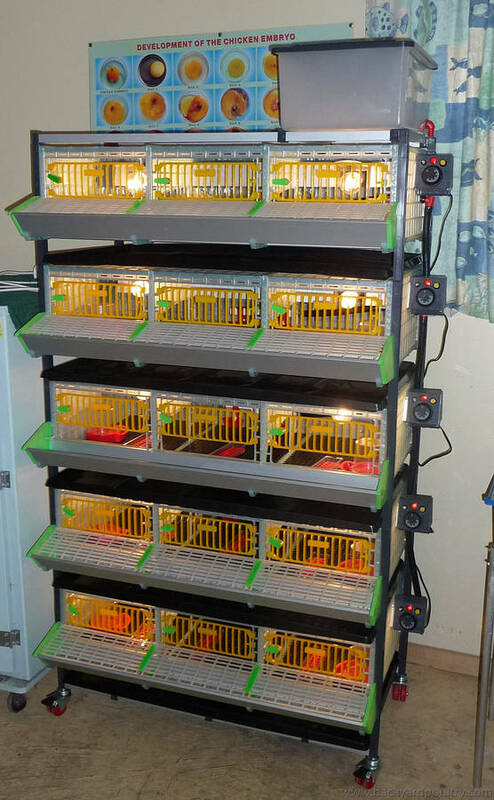 This morning I just doubled up on one tier and have 42 chicks in with plenty of room to move about and feed and drink. 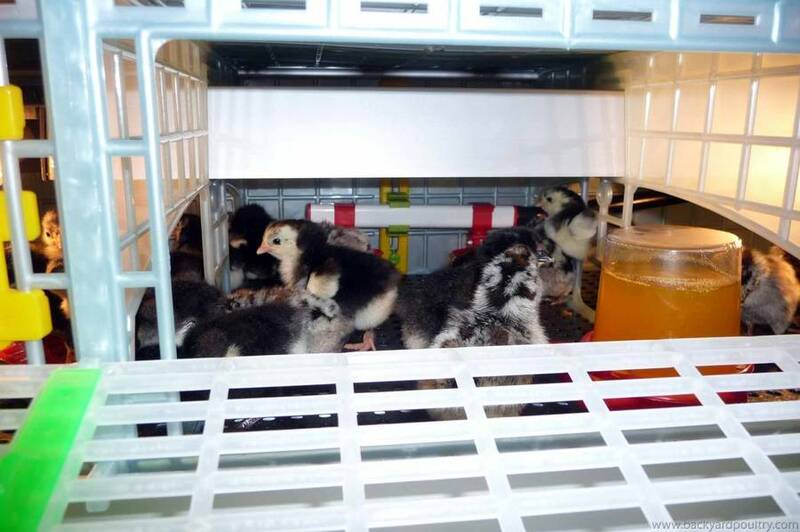 We move them out after about four to five weeks when they feather up to go to a larger growing box. It's really just a matter of daily management and decisions. I was on the phone last night to the manufacturer in Europe and due to their popularity there is an approximate waiting time of about 4 to 6 weeks on all sizes for delivery to Australia. I currently have one x 5 Tier and two x 3 Tier pre-ordered & pre-paid by breeders, and they are patiently waiting on them. Believe it or not I first staring negotiating on my 5 Tier unit for over two and a half years before they were officially manufactured and marketed. A friend saw the prototype at a European agricultural display and emailed me about them. They are so pedantic to make them to perfection that they wouldn't send the first one to Australia before they were satisfied with the end product. It was certainly worth the wait. Ok, we hope that we can answer your questions with the enclosed pictures. Luckily we took several before the final assembly as we knew many people might wish to buy them. 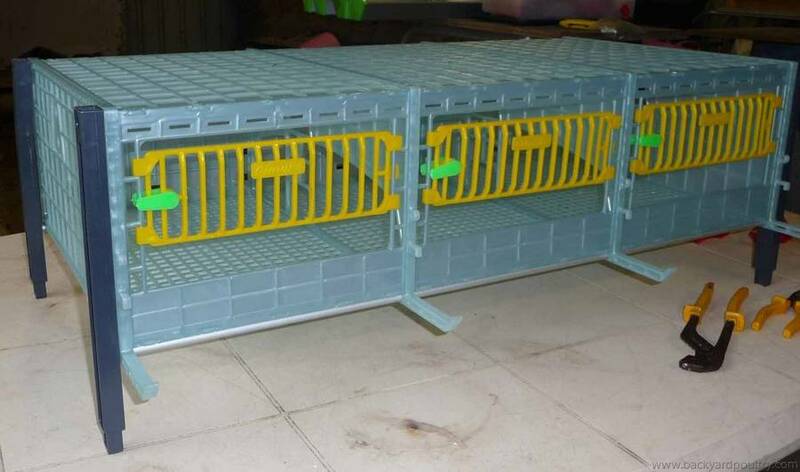 First of all the floor space on each floor is 930mm x 460 mm, compared to our old Maino Brooders which is 880mm x 430 mm. That gives you more usable floor space for your chicks. 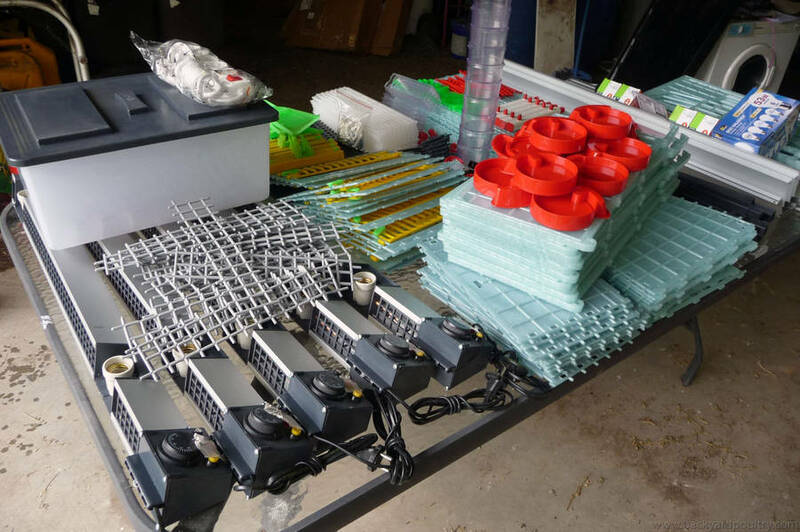 This picture shows the whole unit on a table ready for assembly. At first it looks a little daunting but it's just like assembling a Meccano Set. It's pretty easy. Those five long oblong shaped units on the left are the heater units. The floor is not a metal mesh. It is a strong thick plastic. As metal tends to rust and we found in the Maino that the not only did the mesh rust, it also came loose at the fittings. This picture of one partially assembled tier shows the basic one piece floor structure. Placed over the top of this thick plastic mesh are three tailored mats. This next picture shows the plastic mesh flooring a little better and also shows the little trick we used with a pair of pliers to clip the fronts to the sides.